Maddie doesn't have a choice. The forehead of every person she sees is marked by the shadowy digits of their deathdate. Her unique, innate skill often feels more like a curse than a gift, and Maddie grudgingly puts it to use identifying deathdates for the paying customers her mother reels in. It seems like a straightforward way to help support her family-until one client's young son goes missing on the exact date Maddie has pinpointed, and she gets pulled into a homicide investigation that turns her world upside down. As more young people disappear and are later found murdered, suspicion swirls around Maddie. At once a suspect in the investigation, a target for the murderer, and a partner in a tantalizing dance with a boy who might be connected to it all, could Maddie also hold the key to cracking the case? This perfectly plotted high-stakes, fast-paced thriller marks New York Times best-selling author Victoria Laurie's YA debut and brims with depth, heart, action, and romance. Praise for When "Laurie's debut for teens is quite an accomplishment...The character development is just as riveting as the plot in this well-constructed thriller." "The novel packs in plenty of fast-paced, nail-biting fun, perfect for fans of Barnes' The Naturals series." "This excellent book is a must-have for all libraries, especially where suspense and teen-life fiction is hot. 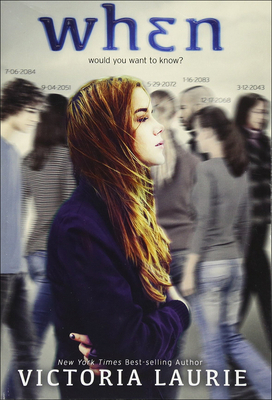 This novel will provide crossover appeal to both older teens and adults." Victoria Laurie is the New York Times best-selling author of the critically acclaimed YA thriller When and the upcoming Forever, Again. She also writes extensively for the adult paranormal mystery genre. She currently lives and works in a quaint little suburb in Michigan where she provides food, love, and shelter to a lippy parrot named Doc and a ginger-colored pup named Ember. To find out more about her and her books, please visit victorialaurie.com.